What's new in mp3Tag Pro 8.3? 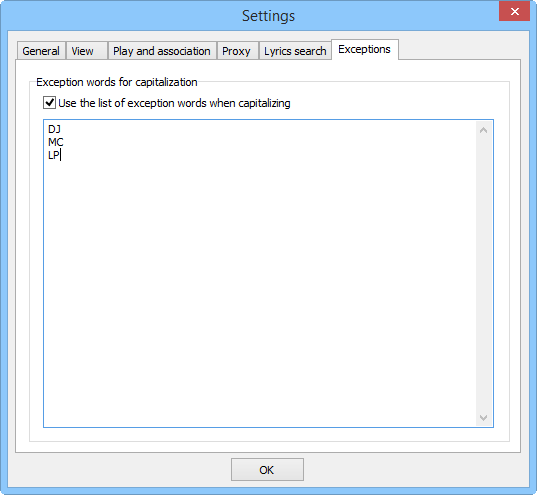 [+] An option to use exception words that are not affected by the capitalization rules. mp3Tag Pro offers several capitalization rules. When using these rules (in particular, the "Only First Up" rule) you may want to keep some words unchanged. For example, "DJ" or "dj" may look good, but "Dj" isn't. The new feature of mp3Tag Pro 8.3 allows creating a list of words that aren't affected by the "Only First Up" rule. [+] It is now possible to skip files that already have lyrics when downloading lyrics for a group of songs. Previous versions of mp3Tag Pro downloaded lyrics for all songs that you selected. While mp3Tag Pro 8.3 does that by default, too, it is now possible to skip files with lyrics. 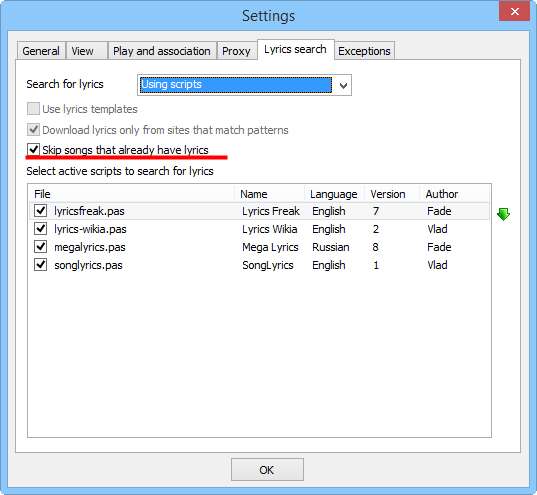 If you are sure that your files contain the correct lyrics, just enable the option on the "Lyrics search" tab of the "Options" menu. [-] Fixed capitalization of tags that contain points. The previous version of mp3Tag Pro treated phrases with points (but without spaces) as words. For example, "L.A. Is My Lady" would turn into "L.a. Is My Lady", if you used the "Only First Up" rule. mp3Tag Pro 8.3 treats items separated by points as separate words, and the above given title is capitalized correctly. [-] Fixed deleting files (deleted two files instead of one). 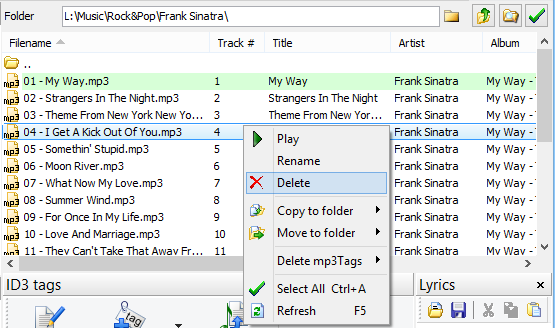 You can delete files directly from mp3Tag Pro, using the right-click menu. A bug was discovered in the previous version of mp3Tag Pro that could lead to deleting two files instead of one. The program would delete both the selected file and the one that followed it in the list. This problem was fixed in mp3Tag Pro 8.3. [-] Fixed reading ID3 tags. For some MP3 files, the previous version of mp3Tag Pro could show incomplete tags (or no tags at all). mp3Tag Pro 8.3 works with such files correctly. [-] Fixed saving some FLAC tags. FLAC files containing certain sets of data could be saved incorrectly by the previous version of mp3Tag Pro. This problem was fixed in mp3Tag Pro 8.3. [-] Fixed saving Replay Gain in MP3 files. While saving new or updated tags into MP3 files, the program could erase their "Replay Gain" values. mp3Tag Pro 8.3 saves the "Replay Gain" value correctly. [-] Fixed reading the Album Artist field from FLAC tags. A problem was discovered in the previous version of mp3Tag Pro that prevented the program from reading the existing "Album Artist" field of FLAC files. This was fixed in mp3Tag Pro 8.3. [-] Fixed exporting and importing tags. When exporting tags to CSV files and importing them back, previous versions of mp3Tag Pro could experience certain difficulties. mp3Tag Pro 8.3 fixes the issue. [-] Fixed renaming files using the pop-up menu in the main window of the program. 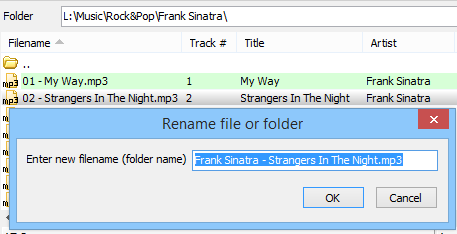 You can rename files using the right-click menu in the main window of mp3Tag Pro. In the previous version, there was a bug that required repeating the operation two times, before it really worked. In mp3Tag Pro 8.3, renaming works as expected, without several tries. [-] Fixed displaying tags in the grid after saving them. Previous versions of mp3Tag Pro updated tags in the list of files only when the focus moved to a different file. This, if you updated tags and did not change focus, your changes were not displayed in the list. mp3Tag Pro 8.3 updates tags in the list immediately after saving them.